Let's get one thing straight right up front: wealthy white American male Republican and Fox Business Network TV personality Eric Bolling is not racist. Eric Bolling wants to make that perfectly clear. That said, he is kind of racist. 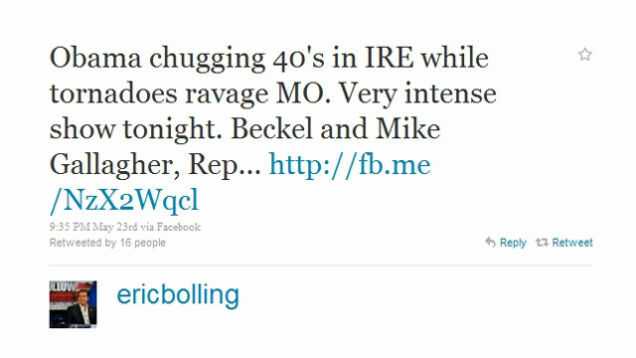 Earlier this week, Bolling provided some economic analysis of President Obama's trip to Ireland: "Obama chugging 40's in IRE while tornadoes ravage MO." Of course, libtards on the internet immediately assumed there was some sort of racial context to that statement, whereas Eric Bolling, recipient of the Maybach Man of the Year award at the Trader Monthly Awards in January 2007, had not even considered race, at all, when he made that facetious statement about our president. Is that guy black? Eric Bolling hadn't even noticed. Now he has to school all you people playing the race card. He drank 40s, okay? In Chicago, no less—the same place Obama drinks his 40s! Bolling goes on to say, on the Twitter, "For the liberals offended by my "forty" comment, please read this...." and includes a link to this definition of "forty" in "The Online Slang Dictionary." Spoiler: it means "a 40 ounce bottle of an alcoholic beverage." This means Eric Bolling is not racist.